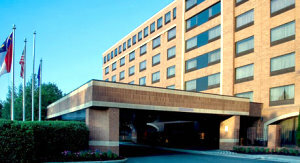 Located in the center of North Carolina's Research Triangle, the Hilton Garden Inn is situated between downtown Raleigh, Chapel Hill and Durham – the seat of innovation in North Carolina. Just three miles from Raleigh Durham Airport (RDU) and in the heart of Research Triangle Park RTP, it is minutes from IBM, Cisco, Cree, Credit Suisse, Underwriters Laboratories, Teleflex, Avaya, Fidelity Investments, Bank of America, North Carolina Central University, North Carolina State University, UNC Chapel Hill, and Duke University. 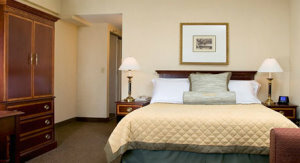 The hotel features renovated guest rooms, signature bedding, ample work space, complimentary high-speed Internet access and pleasant views of the country's largest research park – spread over 7,000 acres. Fitness options include an on-site pool and fitness center, featuring cardiovascular equipment and hand weights. For special events and meetings, the hotel offers more than 6,650 square feet of flexible function space with five distinctive meeting rooms, the largest of which can accommodate up to 150 guests. The renovated guest rooms include: BeWell Bedding and True Blue® Spa bath amenities by Bath and Body Works®, Wolfgang Puck™ coffee, coffee maker, mp3-iPod™ adapted alarm clock, spacious desk with the Herman Miller® Aeron® ergonomic desk chair and two-line cordless speakerphone with voice mail, complimentary high-speed Internet access and free USA Today. 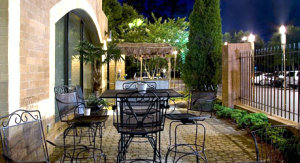 The Garden Café is open for breakfast and dinner and has seasonal outdoor dining. Located just off the lobby, the Garden Café Lounge is the place to gather with colleagues, grab a coffee and mingle with fellow guests, or enjoy a cocktail while you catch up on the day's news and sports. 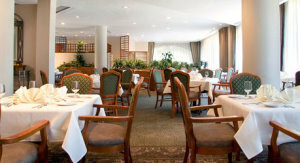 The hotel also offer room service.